This month has well and truly been awards season in the world of hospitality and we have been lucky enough to sponsor and attend three award ceremonies this November. We started with the closest to home, the Cornwall Tourism Awards on 1st of November, then we had the Trencherman’s Guide awards on the 19th of November and finally we ventured across the border for the Devon Tourism Awards just a few days ago on Thursday 22nd of November. Each award ceremony is special and means so much to those entering and those sponsoring, so we wanted to pull together some thoughts and pictures of our experiences with the awards this month. Being part of the Cornwall Tourism Awards has been a long-standing tradition at Hotel Perfect. We choose to support the awards as we believe in giving praise to and acknowledging the accomplishments of our county’s tourism businesses, many of whom we are fortunate enough to have as our customers. It’s always great to see customers and partners of ours at an event like this as it’s blissfully at odds with a traditional business meeting or networking event where we might often meet. Instead there is always a real vibrancy and excitement, which is a lot of fun even if we aren’t up for any awards ourselves. 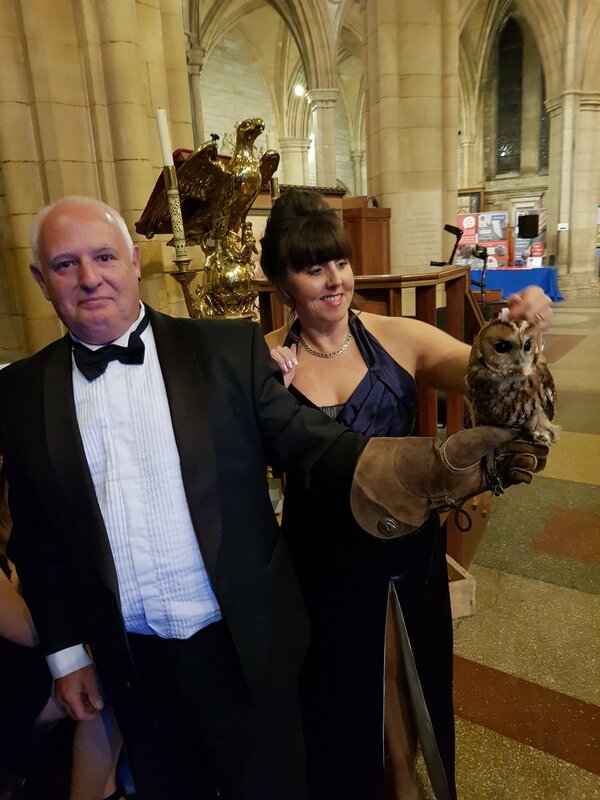 This year we met some fantastic characters at the event in Truro Cathedral, not least this beautiful owl that Amanda was quite taken with! We tend to support the Large Hotel of the Year category as hotels are our core business, but it’s amazing to see the quality and variety of tourism business we have in the South West, no wonder so many thousands of tourists flock to us every year! It goes without saying that we are immensely proud to work with many winners of the Cornwall Tourism Awards, as well as a number of other recognition bodies throughout the industry. To know that our software and support help to make them winners is an incredibly satisfying feeling, and always encourages us to keep innovating and designing better and better software for our industry. Here are some photos from the night of our Managing Director Andrew Risely and Large Hotel of the Year winners and our customers, The Alverton Hotel and Carbis Bay Hotel. Next came the Trencherman’s Awards and my oh my were our bellies rumbling with anticipation! The Trencherman’s Guide showcases the Crème de la Crème of food in our region and the food on the evening of the awards did not disappoint. Cooked by our hosts and previous winners Saunton Sands Hotel, we were completely spoilt by course after course of exquisite food. Saunton Sands as a venue was just perfect and the precision and organisation of the waiting team was beautiful in its’ perfect execution. Again it was great to see a number of our customers nominated for awards, it just goes to show that although hotels are all about beds, the food is often award-winning as well! 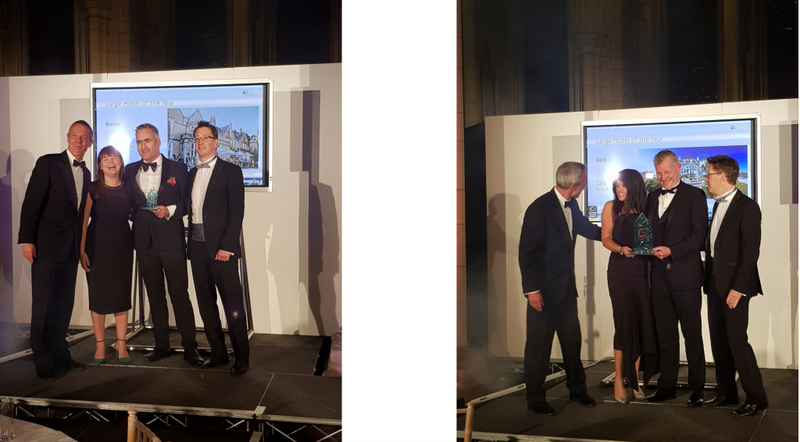 This time it was the turn of Hotel Perfect Business Development to go on stage; here are some photos of Mel Kimpton with some of the nights winners in the Best Dine & Stay category. Finally for 2018 (before we see who makes it through to the South West Awards which are held in February) we had the Devon Tourism Awards, organised perfectly as ever by Robin Barker and Services 4 Tourism. It’s no easy feat getting to the venue, but once at Highbullen Hotel Golf & Country Club, you could be forgiven for thinking you were nestled away in a fairytale countryside, untouched by civilisation. The awards were held in The Palazzo, a purpose-built events centre which was flawlessly setup for the occasion, with a top notch team of unfaltering catering staff. This year we saw the debut of Thomas Chartres-Moore as our host who was really fantastic, just the right blend of comedy and efficiency. Again we sponsored the Large Hotel of the Year category, and were able to send Mel back up on stage to hand out awards to Salcombe Harbour Hotel, Bovey Castle and our hosts, Highbullen Hotel. Here are some shots of the winners in our category. And so for a couple of months the awards season goes on hold, the winners can sit back and admire their victories and we can all enjoy Christmas. But February is just around the corner and will give us the South West Tourism Awards before the finals at Visit England Awards, so watch this space!